Celebrating the life of Frank E. Schneider, Jr.
Obituary for Frank E. Schneider, Jr.
Frank Emil Arthur Schneider, Jr., age 92 years, of Delaware Township, NJ, died on Sunday, November 11, 2018 at his daughter Darlene’s home in Hellertown, PA.
Born in Maplewood, NJ, August 11, 1926, he was the son of the late Frank and Ida Smeltzer Schneider, Sr. He had resided in Delaware Township since 1954. Mr. Schneider was a United States Army veteran of World War II serving in 1945. A former stock car driver and mechanic, Frank raced for 30 years, sometimes 8 times a week. He raced all over the United States & Canada. After full time then he raced until the 1990’s on weekends, then he raced occasionally. He did all the building & motors himself. He sometimes used things from the junkyard. 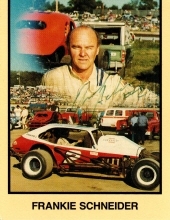 He ran go-carts, Modified, Sprints, Road Racing, USAC Championship, Midgets, slingshots, indoor midgets, late models & Nascar! Frankie belonged to the following: Free and Accepted Masons, Scottish Rite, Shriners, 200 Club, and the Moose Lodge. Mr. Schneider was predeceased by two sisters, Lorraine Linico & Elenor Sahaydak, a brother, Charles (Bunny) Schneider. Surviving is his brother Robert Schneider; his wife, Barbara (Bobbie) Schneider; Mr. Schneider had ten kids, including three triplet girls that passed not long after birth; many grandchildren, great grandchildren & one great- great granddaughter. Calling hours will be held on Friday, November 16, 2018 from 5:30-9PM and on Saturday, November 17, 2018 from Noon-5PM in the Holcombe-Fisher Funeral Home, 147 Main Street, Flemington, NJ. Cremation and interment in Rosemont Cemetery, Rosemont, NJ will be private. In addition, friends, family, and fans are invited to the Flemington Moose Lodge, 81 Barley Sheaf Road, immediately following the visitation Saturday. In lieu of flowers, memorial contributions may be made to the Arc of Hunterdon County, 1465 Route 31 South, Annandale, NJ 08801. Please visit www.holcombefisher.com for further information, or to send condolences, or the online Tribute Pay to assist with the family’s funeral expenses. "Email Address" would like to share the life celebration of Frank E. Schneider, Jr.. Click on the "link" to go to share a favorite memory or leave a condolence message for the family.